To accentuate the glow of the jewelry our jewelry craftsman chose 4-prong setting for the center and pave setting for the side stones. Shape: Radiant. Style: Halo Split Shank Wedding Ring. Halo Split Shank Wedding Ring. Our simulated diamonds are carefully crafted to be nearly flawless and colorless in every way. Eachdiamond is created with its one of a kind brilliance and fire. Your friends are wearing without your knowledge and your jewelers do not want you to know. A mild solution of warm soapy water is an excellent way to freshen up your clarity enhanced diamond. Allow your jewelry to sit in the solution for about ten minutes. Rinse after you’ve given your jewelry a thorough cleaning making sure you reach the underside of the diamond in its mounting. Diamond Solitaire Rings. A mild solution of warm soapy water is an excellent way to freshen up your clarity enhanced diamond. Allow your jewelry to sit in the solution for about ten minutes. Rinse after you’ve given your jewelry a thorough cleaning making sure you reach the underside of the diamond in its mounting. These quality man-made gemstones are made of a composition that simulates real diamonds. The hardness of this princess cut diamond is 9.1 on the moh's scale and will scratch glass just like diamond. 14k White Gold Halo Diamond Ring. 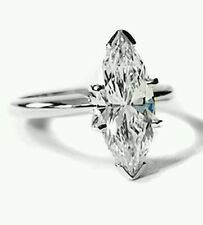 DIAMOND CLARITY: VVS1 - DIAMOND COLOUR: D. GEM TYPE: Simulated Diamond. NOT REAL NATURAL DIAMONDS. NOT man made diamond. Very similar to a diamond in refractivity and appearance. Want to add your personal touch to this piece?. As a Matter of Fact, This Man-made princess Cut Diamond Looks Much Better Than a Real Diamond Because It Has an Excellent Cut and Clarity. Solid, Real, Genuine White Gold also Available in 14k Yellow Gold. This dazzling platinum classic wedding ring showcases 1.69 carat round brilliant stone that was graded by AGI labs as simulated diamond with D color (Colorless), VVS1 clarity (Eye Clean) and Ideal Symmetry. To bring out the radiance of the item our master jeweller used tension setting. The certificate that comes with this ring indicates the 4C's and the appraised retail value of $3,947. At Extra Brilliant, your satisfaction is guaranteed and your money is fully protected by our 30-Days 100% money back guarantee. Customization Want to add your personal touch to this piece?. The center round brilliant stone weight 1.09 carat and graded by AGI laboratories as simulated diamonds with D color (Colorless), VVS1 clarity (Very Clean) and Ideal Cut and proportions. RingsSOLITAIRE RINGS ACCENT RINGS MATCHING BANDS THREE STONES FANCY COLOR. Delicate in design, this platinum halo classic accents ring features 27 stones with a total weight of 1.51 carat. The center princess cut stone weight 1.05 carat and graded by AGI laboratories as simulated diamonds with D color (Colorless), VVS1 clarity (Very Clean) and Ideal Polish. Cut: Asscher, simulated. We use the finest simulated diamond in the market. Our simulated diamond shine bright like real diamonds! Downtown LA. We take pride in our work and hope to have a chance to work with you in creating the. GEM TYPE: Lab Created. Accent :-0.58 ct. Center Stone:-1.00 ct. Total Carat:-1.58 ct.
GEM TYPE: Lab Created. Center Stone:-1.25 ct. Total Carat:-1.50 ct.
Solitaire Rings. The center diamond is VVS1 in clarity & D in color and securely mounted in 18k gold setting, making for a simply amazing piece of jewelry. Diamond Rings. Diamond Jewelry. Diamonds-Tiffanys-Jewelry – Diamond & Jewelry manufactures and exports fine diamond jewelry. We use the finest simulated diamond in the market. Our simulated diamond shine bright like real diamonds! Cut: Round, Excellent cut and shine. Cut: Oval, Excellent cut and shine. Center Stone . The tapered cathedral stylish ring has a presence that is both elegant and dramatic. Shape: Princess Cut. These quality man-made gemstones are made of a composition that simulates real diamonds. The hardness of this princess cut diamond is 9.1 on the moh's scale and will scratch glass just like diamond. We use the finest simulated diamond in the market. Our simulated diamond shine bright like real diamonds! Cut: Oval, simulated. Cut: Round, simulated. Center Stone Side Stones Total weight is 1.75ct. GEM TYPE: Lab Created. Accent :-0.52 ct. Center Stone:-1.00 ct. Jewelry Authentication Certificate: You will get appraisal from certified laboratory. Pure 925 Sterling Silver Jewelry. No alloy, nothing. If you like to make any changes to be made on a particular product of ours for ex. From Our exclusive Designer Collection, this platinum trellis engagement set features 1.69 carat round brilliant stone. This stone was graded by AGI labs as simulated diamond with D color (Colorless), VVS1 clarity (Eye Clean) and Ideal Cut and proportions. To bring out the radiance of the piece our master jeweller used 4-prong setting. The certificate that comes with this ring set indicates the 4C's and the appraised retail value of $3,133. At Extra Brilliant, your satisfaction is guaranteed and your money is fully protected by our 30-Days 100% money back guarantee. GEM TYPE: SIMULATED. Center Stone:-1.00 ct. Total Carat:-1.60 ct. Shape. ROUND BRILLIANT CUT. Shape. . Round Brilliant Cut. Accent Gemstone Info Color. . Color. .D. GEM TYPE: Lab Created. 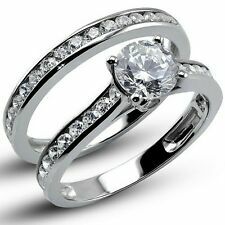 Accent :-1.50 ct. Total Carat:-1.50 ct.
Solitaire Rings. Wedding Bands. Diamond Jewelry. The center diamond is VVS1 in clarity & G in color and securely mounted in 14k gold setting, making for a simply amazing piece of jewelry. Diamond Rings. Accent smaller stones are. 02-.03 Carat each. Total weight of ston. The stones are High grade Zeconia. They are hand cut and polished exactly like diamonds. They are nothing like and ordinary Cz and they are harder and will not get cloudy or scratch like CZ, These are not syntactic carbon diamonds that are very expensive almost the price of a natural diamonds,however they last like natural diamonds and shine and look better than 80% of all the natural diamonds out there. Bridal Sets. Through the use of ADT (amorphous diamond technology) technology man-made diamond crystals are infused into simulated crystals to create a diamond top that is made of pure carbon SP3 bonds. ; Made in 14K Solid White Gold. (not gold plated). ; Center is 1.50 Carats Princess Cut Lab Created. ; Brilliant cut, beautiful shine and loop clean. ; will scratches glass. To accentuate the glow of the ring our jewelry craftsman chose 4-prong setting. RingsSOLITAIRE RINGS ACCENT RINGS MATCHING BANDS THREE STONES FANCY COLOR. Carat Weight: 1.66. Gem Type: Simulated Diamond. Beautifully graceful in its simplicity, this platinum classic solitaire ring showcases 1.66 carat round brilliant stone that was graded by AGI laboratories as simulated diamond with D color (Colorless), VVS1 clarity (Very Clean) and Ideal Cut and proportions. Capture your lasting love with this timeless platinum halo cathedral wedding ring showcases 39 stones with a total weight of 1.63 carat. The center oval shape stone weight 1.23 carat and graded by AGI labs as simulated diamonds with D color (Colorless), VVS1 clarity (Eye Clean) and Ideal Cut and proportions. To bring out the radiance of the piece our master jeweller used bezel setting for the center and pave setting for the melees. The certificate that comes with this ring indicates the 4C's and the appraised retail value of $3,636. At Extra Brilliant, your satisfaction is guaranteed and your money is fully protected by our 30-Days 100% money back guarantee.